Lord Sai Baba is an ocean of Mercy and Compassion. He works for His devotees in such a way that they are spell-bound on results. Ultimately it increases faith of devotees. Faith of below Anonymous Devotee was also strengthened in miraculous manner. Anonymous Devotee from USA says: Dear Hetal Ji, This is a wonderful site for all Sai devotees to calm their minds when in trouble. The experiences of various devotees increase the confidence on Sai Baba immensely. Please do not disclose my name or email-id. I currently reside in the US. I came here to do my Master's and now working. This happened last year. I hadn’t visited India after coming to the US due to status issues and 3.5 years passed by. Finally, I decided to go to India for a vacation for 5 weeks. So I was all excited because I had a job and could take gifts for my family and friends. Now I was in India and was enjoying the food and travel. I had some urinary problems while in the US and the day I landed India my dad took me to a doctor. In the mean time he asked to get my thyroid test done. I was reluctant in the beginning, but then eventually agreed. I got my reports after a week and did not bother to look into it. Just the week before I was leaving to the US, my dad and mom asked me what happened to the reports and asked me to meet his friend who is doctor to see if it was normal. However my Dad's friend took me to a physician, who said the hormone level is high, so she may have to get more tests to start the medication. So I went for the other tests and in the final test the diagnosed that I have thyroid cancer. My whole family was shattered. I could not see the pain my parents went through. We consulted a surgeon and they said I need go for a surgery. They also explained us that this is the best type of cancer where the person can lead a normal life after the surgery. All this while I used to pray to Sai Baba and read Shri Sai Satcharitra as my friend introduced me to it. But I was not a firm believer. But after this shock of my life, I started praying and believing Sai Baba even more. My surgery went well which was on a Thursday. Doctors said that it was the first stage and I can be normal after few weeks. But this incident completely changed my approach towards life. I started appreciating life more and my belief on Sai Baba just grew stronger. He has made me stronger. After all this I came to the US and started my job. Few months later, I used to have neck pains and I got really worried. But I had belief in Sai Baba and prayed for my good health. The reports were Normal. Few months after this, I got pain in my breasts which scared me a lot. I used to cry every day, but I still prayed and believed in Sai Baba. With His blessings, pain disappeared and the reports were Normal. There are lot instances like this, where Sai Baba has held my hands during my trouble. I consider Him as my best friend with whom I can share all my feelings without being hesitant. God Bless everyone. Jai Jai Sai. This happened last month. I was doing full-time MBA with a university in California and also working. It is an online course. I live in the east coast. Usually every time I register for the courses, I get an I-20 which permits me to work even though I am a student. I was supposed to file my H1 couple of months back, but my employer delayed the submission and the quota was over. I felt very disappointed. I had to now register for courses spending $4000, which is huge amount for me. But I had no other option to go. After few weeks, I received an email from college saying my Grades are not good, so they cannot issue I-20. I was shocked because I had been performing well throughout except for the semester, when I underwent a surgery. I could not attend that semester and had taken a break. My friends had submitted all the medical documents necessary. But due to miscommunication they had given me F grade, which is fail grade. This affected my overall grade. I tried to explain my college how important it is for me to get the I-20 else I would be out of status and go back to India and cannot work. I also explained why I could not attend that semester and reason. I literally sent more than 60 emails to all people possible. I was really feeling bad. But I did not lose the confidence or belief in Sai Baba. In fact it grew stronger because somewhere in the corner of my heart, I knew He was always there for me. I also had decided and made up mind to go back if nothing works. My manager is very good and she actually asked to take vacation instead of quitting the job and held my position. Finally, one Thursday, just before the New Year, I got an email with my copy of I-20. It was a miracle because the college people were very adamant in their decision. All this happened only because of Sai. I got my job back and I am relieved. Om sai ram.. Sai is great! May Sai's blessing be on you and everyone always! Wishing you the very best! Very nice experience ,Faith in Sai helps us overcome all hurdles . I really wanted to read a devotee experience oozing with love and faith in our Baba. I m so happy I read ur experience today. May baba b on ur side always and bless you with health and prosperity. Lots of love to my dear Baba ! Baba is amazing - im currently having him take care of my health and I know he will ... i m sure - I love this guy - he has given me everything I prayed for and more. He is miraculous. We r fortunate to have him in our lives. All d best fr ur future...hav faith in sai...the only mantra...omsairam!!!! This one is such am motivating Leela of our beloved father and master Sai Deva :-) When he is around we need not fear for anything in the least. He is sure to hold our hands though all the ups and downs of life. Good to read your experience and wish you all the very best in life, health wise and in all other aspects too. Baba loves you a lot and is caring for you always. May Baba bless us all always. We are all his loved children. I would like to share a small miracle i experienced yesterday. I went to the Samsung store to get an earphone for my cell. I had bought an earphone sometime back which had cost me around Rs 650. And it was lost last month. So i had to buy one again and i was a little sad on spending again. I was praying Baba, that i should get the same earphones from Samsung within Rs 400. I just hoped that Baba will make it possible. And it cost me exactly Rs 386 :-) I was so happy. Sai fulfills even the smallest of our wishes :-) He is always there for us. Love you lots Deva. Please do bless us all always and help, guide and advice us in all matters of our life. Always at your lotus feet. May SAI ALWAYS BE WITH YOU AND PROTECT YOU FROM THAT ILL DISEASE. Baba please bless your devotees with good health and happy life. 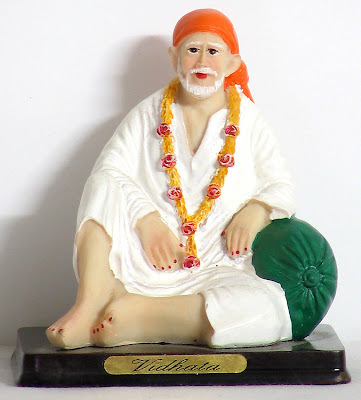 Jai Sai Ram. Very happy that you are healthy now and also relieved of your job stress. Baba is the saviour of the universe, nothing is impossible to Deva. Some times it takes time for our bus and we have to with complete faith & Patience. You have proved that you have both the things Baba always asked for. Please do not worry and Baba is always with you. I wish you a great success in your life. Lets bow to the holy and old feet of our beloved father Shri Sainath. Jai Sainath. Om Sai Ram ,i m out of station for 8 days so not able to follow properly the bolg..just wanted to share all divotees that Anonymous divotee who posted luv problem on 14th feb got job by baba's grace,may sai bless all.I got his mail today only. You had UTI and your Dad made you do thyroid test is the evidence that Baba wanted to save you. Don't worry. Do your part eat healthy, exercise and leave the rest to Baba. He will surely keep you healthy. Baba please give all of us devotees peace of mind and complete faith on you.Jai hum sabke Sai Baba ki. Dear blessed Sai Devotee, praying for your healthy days ahead. Very happy that you could get I 20 forms and keep your job. Wishing you all well. "JAI SHREE SAI BABA" "JAI SHREE SAI BABA" "JAI SHREE SAI BABA" "JAI SHREE SAI BABA" "JAI SHREE SAI BABA" "JAI SHREE SAI BABA" "JAI SHREE SAI BABA" "JAI SHREE SAI BABA" "JAI SHREE SAI BABA" "JAI SHREE SAI BABA" "JAI SHREE SAI BABA"
Hetal jee hats off to you..you have created a global sai family ..the true meaning of vasudev kutumbkam..
May BABA bless you with good health and wonderful life. I do remember the experience, you mentioned. Thanks for letting us know the good news. I really liked the comment "he will get his love if that is good for him..if not something better..."
Let Baba decide what's best for the guy. dont worry for any thing sai baba will always take care of his children.we will pray for your good health and good life ahead. Bolo sainath maharaj ki jai.. Very nice experiences! Baba must have given the devotee the I-20 form even after so many worries, we know that Baba is there to help and guide us, and we should have faith in him that he controls everything in the universe and will take care of everything for his devotees, so we need not worry so much. For the devotee from USA, don't worry, Baba will take care of all health problems and may have given this to you to have you appreciate all the small things in life more. Om Sai Ram!